Simply pronouncing the name Txakoli is a challenge. “Chak-oh-lee” is Spain’s proudly Basque wine, the vineyards hugging the dramatic and beautiful Atlantic coast (some quite literally). The producion of Txakoli has a long history, though one that was only recognised with its own Denominación de Origen (DO) stamp in 1989, first granted by the Basque government, then later by the Spanish government in Madrid. It is a region of small, family growers and producers, and its market is mainly local (only 15% of Txakoli’s production is exported). Txakoli was for centuries a wine that was made purely for home or very local consumption. Winemaker at Txomin Etxaniz, Ernesto Chueca, tells me that as recently as the 1980s the region’s vineyard area was in steep decline, because very few families wanted to make wines which, without a DO, were cheap to buy yet costly to produce. Just before DO status was granted in 1989 there were only 50 hectares of vineyard in Txakoli. At this time a group was formed to preserve and promote the wines, and by 2007 vineyards covered 227 hectares, with 18 wineries operating. Today there are 400 hectares under vine, showing the very rapid expansion that has come about over the last few years. “But now we are taking stock and stopping expansion,” Ernesto tells me, “to make sure we have markets for the increased production.” Today there are 24 wineries in operation. 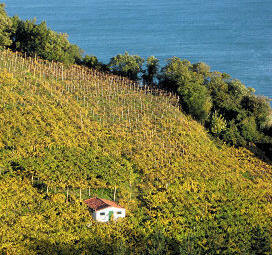 The vineyards of Txakoli occupy the northwest corner of the Spanish Basque Country. Enjoying a level of autonomy from the rest of Spain, the Basques have their own language and government, and are fiercely proud of their own history and traditions. Eighty-five percent of Txakoli wine production comes from the three sub-regions of Arabako, Bizkao and Getariako, or Alava, Biscay and Getaria to translate from the Basque. These regions tend to be featured on the labels, so that a wine from Getaria appears as ‘Getariako Txakolina’ for example. Influenced by the Atlantic, the climate in the vineyard regions is generally damp and mild. The main grapes of Txakoli are the Hondarrabi Zuri for white wines, accounting for the vast majority of plantings, and Hondarrabi Beltza for red. Several other varieties are grown in much smaller quantities, including Izkiriota Ttipia (Petit Manseng) and Izkiriota (Gros Manseng) – both common grapes of Irouléguy, just on the other side of the Pyrenees. Traditionally the wines of Txakoli have echoed the Vinhos Verdes of northern Portugal, which shares a similar climate and proximity to the Atlantic. That means fresh, sometimes even tart whites, often bottled with a little spritz, and much rarer but similarly lean reds. Like Vinho Verde too, high trellis training systems were used to improve air-flow in this mildew-prone region of high rainfall. But again like Vinho Verde, changes have been rapid in recent years, with mechanization allowing new training systems, stainless steel fermentation replacing the old wooden vats, and much better understanding of vineyard management and yield control. The wines still retain that green apple and lemon snap, and often still a little cº2. They are served locally in chunky tumblers just as they always were, but quality has risen steeply. Find all UK stockists of Txakoli on wine-searcher. UK Agent: Moreno. Website: www.txominetxaniz.com. Located in the heart of Getaria, Txomin Etxaniz has maintained its dedication to cultivating vines and making Txakoli for generations. Archives dating back to 1649 mention Domingo de Etxaniz as being linked to growing vines in Getaria, and later the Chueca Etxaniz family was at the forefront of the movement towards modernisation, recognition and the creation of the DO Getariako Txakolina. Today their vineyards cover 35 hectares and they are one of the biggest exporters of Txakoli, their main markets being the USA and Mexico, then the UK, Holland, France and Japan. Ernesto Chueca (right) and his family still own their beautiful 15th century winery in the heart of the city of Getaria, but moved to stunning new location on the cliff edge high above the town, surrounded by vineyards. Run by Ernesto and his two brothers, he shows me their steepest slopes, terraced like those of the Douro. Grapes are hand-harvested into small boxes, before temperature-controlled fermentation and pneumatic pressing. The Txakoli is maintained on the lees until as late as possible before bottling. The wine settles and clarifies naturally without filtering, and a little natural cº2 gives the wines a characteristic, gentle fizz. The main product is Txakoli, but the company also produces tiny amounts of sparkling wine by traditional method and late-harvest wine, in particular years when conditions allow. Sadly these are only for local consumption. The winery is open for visits by appointment. 11.5% ABV, synthetic cork. The big production wine for this estate has a lovely yeasty, herby nose, very delicate with a light lemony flavour. On the palate the faintest sparkle, but a really fresh, with lots of lemony fruit and real vibrant punch. Light and tangy, with those faint herbal flavours adding a lovely complexity. Ernesto served some delicious home-canned tuna with this, and suggested fresh anchovies with olive oil and garlic as possibly the finest match. 89/100. Around £11.99 in Harrods. 12% ABV. Named after Ernesto’s mother and made from the Hondarrabi Zuri, this is aged 15 months in bottle and carries a disgorgement date. Nicely toasty aromatics, lots of nutty notes and the herby and lemony character coming through. The palate is powerful and punchy, with lots of vivid herbal flavours. 88/100. 12% ABV, synthetic cork. Only 2,000 bottles of this wine are produced. It is aged 12 months in barrel and recommended with foie gras by Ernesto. The nose is slightly suppressed compared to the Txakoli, but the palate has a nice orange and lemon fruit, and medium sweetness (65g/l Residual Sugar), with plenty of tang and bright, zippy acidity. 87/100. Sales Contact: Jon Zubeldia. Website: www.senoriodeastobiza.com. A five million Euro investment since 1996 by the owner of this new estate in Txakoli Alava is a leap of faith and a labour of love. 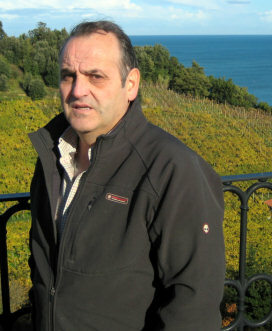 Xabier Abando’s father died when Xabier was just 15, following a 20-year struggle to establish a top Txakoli estate, without any great success. 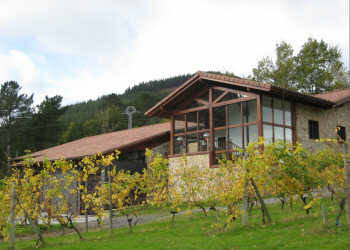 Now, the attractive winery built in 2008 and located in the village of Okendo is well-established and producing Txakoli of good quality, including their limited edition ‘Malkoa’, imported into the UK by Boutinot. Hondarrabi Zuri, Petit Corbu and Gros Manseng are grown, and the winery is state of the art with sorting tables and grapes arriving in shallow 7-kilo boxes. The production of less than 30,000 bottles annually is expanding under the direction of winemaking consultant Ana Martin. Company manager Jon Zubeldia told me that Señorío de Astobiza is always the latest to harvest in this region – the harvest did not begin until 15th October in 2010. 13% ABV, cork. A blend of all three grapes grown on the estate with a refined nose, but the aromatics are a touch suppressed, with just a little citrus and a little leafy, mint leaf quality. On the palate it slightly lacking fruit, with some apple and that herbaceous character coming through. 85/100. 13% ABV, cork. Made from free-run juice and 100% Hondarrabi Zuri, mostly from the oldest vineyards. More aroma here, still with that herby note but also a touch of lime. The palate has quite a rich texture, and a pithy, dry character. Very racy, but a touch of minerality. Tangy, fresh, a touch phenolic perhaps, but in a good way. 87/100. There is not a huge amount of Txakoli around, but a couple more that I have tasted recently are worth including here. Also from Txakoli Biscay and with 12.0% ABV, this has a fine herbal and yeasty nose with a salty, briny character then lovely juicy, but dry and pithy fruit character on the palate. Masses of mouth-watering citrus and seafood-friendly acidity. 89/100. £13.00 at Raeburn Fine Wines.